I like the simplicity of the book because it makes for an easy read. I now have a clearer picture of the greeters role and will take this to my team when we meet this weekend. We were also wondering what to include in the welcome packets that we planned to put together. 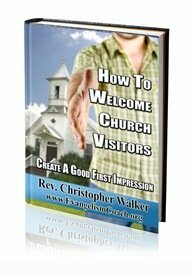 We had some ideas and some samples from other churches and your suggestions are also helpful. I can’t thank you enough for clearing things up for me. It will certainly make my job a lot easier. I don’t feel like I’m spinning in circles anymore.